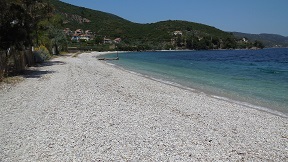 The beach of Steni Vala on the island of Alonissos in Greece, information and pictures. 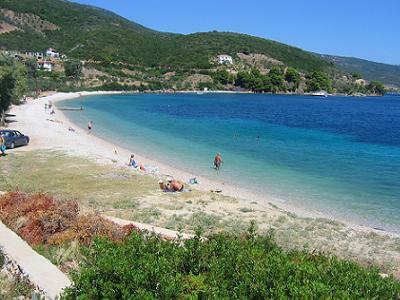 Steni Vala Beach (see: Glyfa Beach) is situated near a small village on the north east side of the island of Alonissos at about twelve kilometres distance of the capital Patitiri, and it was once a hide away for pirates. 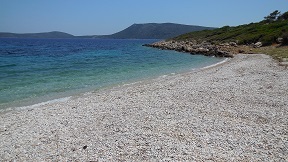 It is a large and narrow pebble beach with quite large pebbles, overlooking the opposite island of Peristera. As far as I know there are sunbeds and umbrellas for rent during high season on Steni Vala and there are only a few trees near the beach. 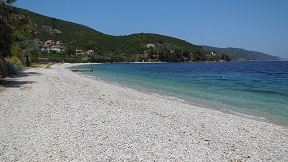 Most of Steni Vala Beach is surrounded by shrubs. On the beach there is a small hut in which the Monk Seal Treatment and Rehabilitation Centre is housed. 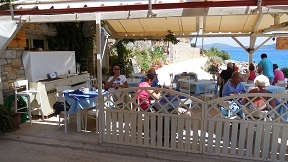 In the village of Steni Vala itself are a couple of taverns and cafés and there are some accommodations for rent. 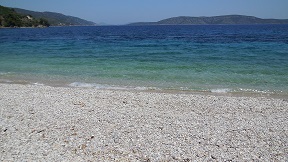 In the wider area there are luxury villas that are being offered for rent to the tourists that visit Alonissos island. 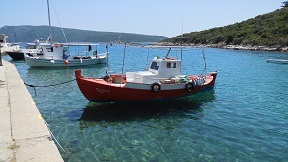 Although the village of Steni Vala has developed into a small tourist resort of its own, most of the inhabitants of the village still still live traditionally from fishery. 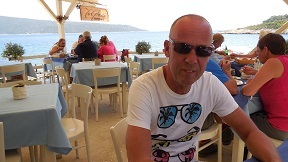 For hotels, apartements and studios in Steni Vala - click here. 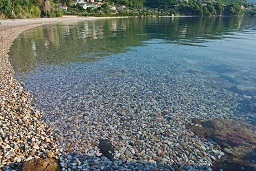 Quietly located on a hillside in the Steni Vala village, Agnantema is 300 m from Glyfa Beach. 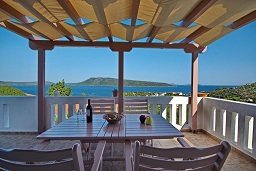 It offers traditionally decorated villas with free Wi-Fi, garden and furnished terraces overlooking the Aegean Sea and the Peristera Isle. Featuring wrought iron or dark wood beds, wooden ceilings, and rustic-style furnishings, all the air-conditioned accommodation at the Agnantema Villas has a fully equipped kitchen with stove and dining space. 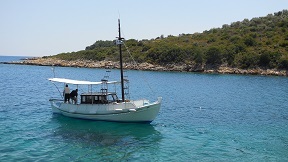 A seating area with cable TV and DVD player is provided. 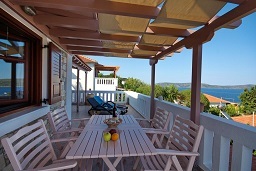 Guests can relax under the pergola on the 20m² terrace that features sun loungers. 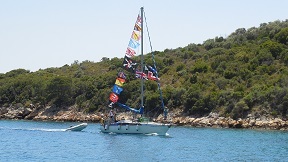 Agios Petros is 1 km away. 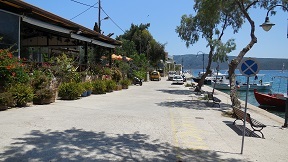 Guests will find a bus stop, taverns and shops at 500 m. Alonissos Port is at 9 km and free transfer is provided upon prior request. 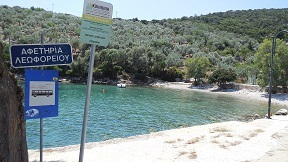 Free private parking is possible at the property. 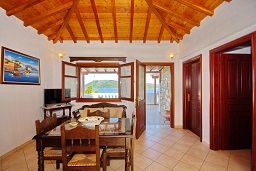 This property is also rated for the best value in Aghios Petros Alonissos! Guests are getting more for their money when compared to other properties in this city. 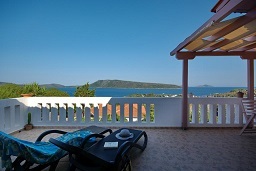 Check availabilities and prices & book Agnantema Villas in Steni Vala beach on Alonissos island - click here. 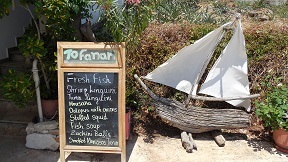 To Fanari restaurant is located in the harbor of Steni Vala on the island of Alonissos and is specialized in seafood, but there are also plenty of other things on the menu, such as chicken, souvlaki, moussaka and salads. 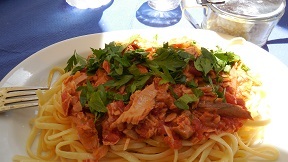 We ordered a linguini with tuna, a chicken souvlaki and a Greek salad. 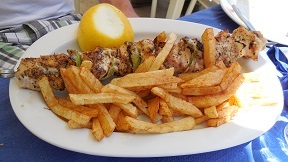 Everything tastes great, but unfortunately the French fries are not crispy. 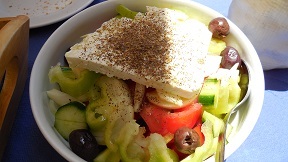 The Greek salad is very good, with delicious feta cheese and some onions, the bread is fresh and crisp. Our verdict: an 8 out of 10.